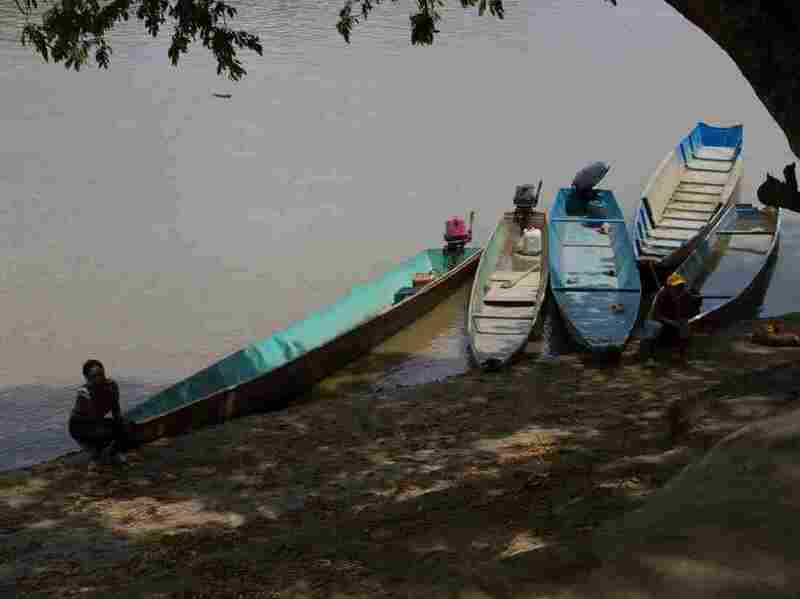 Fleeing Crisis, Some Venezuelans Are Recruited By Rebel Forces Fighting In Colombia Venezuelan migrants come into contact with Colombian guerrillas after crossing the river border. The migrants have turned up among captured and killed rebels, a Colombian military commander tells NPR. Fishermen wait to help people going to Colombia across the Arauca River near San Fernando de Apure in Venezuela in February 2017. More than 1 million Venezuelans are estimated to be living in Colombia. About one-third of the more than 3 million Venezuelans who have fled their nation's deep economic crisis have settled in next-door Colombia. But some of these refugees, instead of finding safe haven, are being recruited into Colombia's guerrilla groups, human rights and military officials tell NPR. It is unclear how many Venezuelans have joined the rebels. But Col. Arnulfo Traslaviña, the army commander in the northern Colombian state of Arauca on the Venezuelan border, said there are "several dozen." Traslaviña said eight Venezuelans were killed last June when the army bombed a guerrilla camp in Arauca that was run by dissident members of the Revolutionary Armed Forces of Colombia, known as the FARC, a rebel group that largely disarmed under a 2016 peace treaty. He said that four more Venezuelans who joined the dissidents were captured this month following a botched kidnapping in Arauca. "This is clear proof that they are recruiting Venezuelans," Traslaviña said in an interview Jan. 10 at the army base in Arauca. Arauca has become a prime recruiting ground for Venezuelan refugees. The state shares a 250-mile frontier with Venezuela and is home to several hundred FARC dissidents as well as a second rebel group, the National Liberation Army, or ELN. Colombian Defense Minister Guillermo Botero is blaming the ELN for a car bomb attack Thursday at a police academy in Bogotá that killed 21 people and injured dozens more. He said the vehicle's driver, who also died in the attack, was an ELN explosives expert who was based in Arauca. Human rights activists say Venezuelans often come into contact with guerrillas as they attempt to cross the Arauca River, which forms the border and is partially under rebel control. Jobless, hungry and disoriented, refugees are especially vulnerable to rebel offers, says Xiomara Sánchez, a government human rights official in the town of Arauca. The guerrillas "take advantage of their neediness," she says. Another human rights official told NPR that the rebels offer food, shelter and the equivalent of $300 per month. That's a small fortune for newcomers from Venezuela where the country's currency has collapsed and the monthly minimum wage amounts to less than $10. "Some of the recruits are minors — 15 or 16 years old — which in our view amounts to forced recruitment," the official said. She moves around with a bodyguard because she has received death threats stemming from her investigations and asked that NPR not reveal her name. Juan Carlos Villate, a government human rights official in Tame — a town in Arauca state that is home to about 5,000 Venezuelans — told NPR that the rebels initially offer migrants seemingly innocuous jobs as cooks and laborers, but that some end up as combatants. All this comes at a time when Colombia's half-century-old guerrilla war was supposed to be winding down. Under the terms of the 2016 peace treaty, the FARC's 7,000 fighters turned in their weapons. Since then, the FARC has become a legal political party and was granted 10 seats in Colombia's congress until 2024. 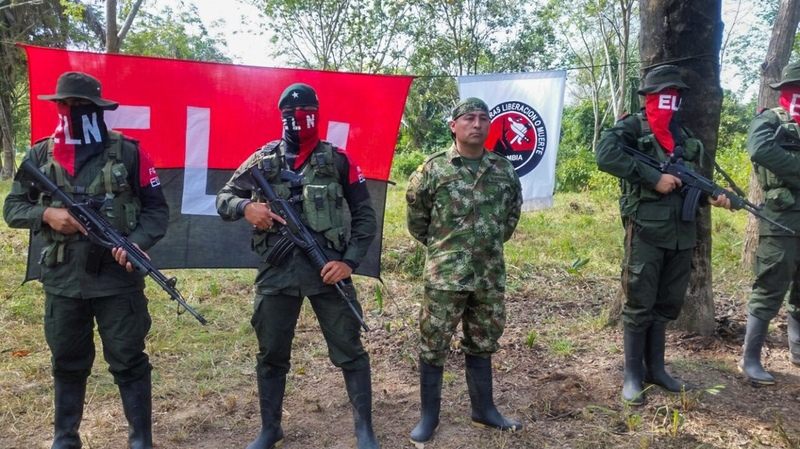 The ELN has also been involved in on-again-off-again peace talks. However, disgruntled FARC members — some of whom claim the government had ignored its peace treaty obligations to help them transition to civilian life — began rearming. Colombian Soldier Fredy Moreno (center) who was captured by rebels of the National Liberation Army, is seen next to ELN members, before his release in Arauca, Colombia, on Feb. 6 2017. Separate peace negotiations between the government and the National Liberation Army have stalled. Members of both that group and the FARC dissidents are involved in kidnappings, extortion, illegal mining and drug trafficking. Colombian intelligence reports estimate there are as many as 3,000 FARC dissidents, while the ELN numbers about 2,500 fighters. "The situation is going to get worse because these groups are bolstering their ranks with immigrants," Villate said. "And the number of Venezuelans arriving here is getting bigger by the day." To dissuade them from falling into the hands of rebels, criminal gangs or prostitution rings, the Colombian government and international agencies have launched food, education and health care programs. At a mobile medical unit set up on a bridge spanning the Arauca River, Colombian nurses provide Venezuelan migrants and their children with vaccinations and family planning information. For those trying to move on, the government has put up posters with maps and information on bus fares and routes to Bogotá, the Colombian capital, as well as to neighboring Ecuador and Peru. Meanwhile, government social workers, like Lisandro Sarmiento, roam the slums that line the Arauca River and are home to throngs of Venezuelans. In a two-room shack made of wood and aluminum sheeting, he meets Jessica Marín, 33, an unemployed Venezuelan mother of three. Nearby sits her bored-looking 15-year-old son, who is not enrolled in school and fits the profile of those targeted by rebel recruiters. Sarmiento patiently explains the red tape that refugees must cut through to place their children in schools. But openly talking to refugees about the guerrillas is taboo because plainclothes rebel militias roam Arauca, keeping a close watch on their activities, said the human rights official who requested anonymity. "To warn them that the rebels are recruiting would be very dangerous for us," she said. "All we can do is tell them about some of the risks that they face in Colombia and how to get help. But we can't directly mention any group by name."